The Serenade has been recorded several times, twice by Peter Pears in 1944, with horn player Dennis Brain, and 1964 with Barry Tuckwell, and both are generally considered reference recordings, although in the 1964 recording, Pears’ voice is showing some signs of age. Anthony Rolfe-Johnson recorded it in 1991 with Michael Thompson (horn) and Bryden Thomson (conductor), a release that garnered generally good reviews when it came out. Philip Langridge, who is some what similar to Rolfe-Johnson, released a recording in 1994, now on Naxos. 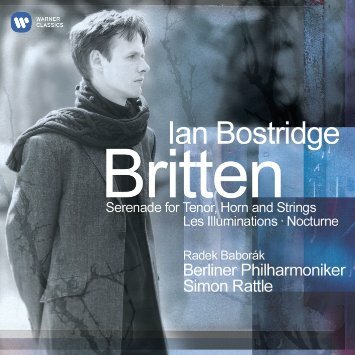 And then an earlier Bostridge recording that came out in 1999, and finally to the one I am listening to today which was released in 2005. There are many reasons to own the first Pears, or the second Pears, but if all you want is to hear these works in beautiful recorded sound with a very good vocal performance, then Ian Bostridge’s latest recording of Britten’s three song cycles for tenor will do very nicely. Simon Rattle and the Berlin Philharmonic strings certainly play with precision and warmth, and the first horn of the orchestra, Radek Baborak, is Tuckwell’s equal in excitement. British critics have acclaimed this recording as the only modern recording equal to Pears/Britten. That said, depending upon your preferences for the other works that fill out the various recordings, any of these will be a well worthwhile investment of time and treasure.